President Maithripala Sirisena yesterday said he was either ready to abolish or prune down the powers of the Executive Presidency. “I am ready for either. That was my commitment,” the President said. “We have now completed two and a half years in government- criticism, allegations and insults are in plenty. They are very common features of a vibrant democracy,” President Sirisena said. He referred to the past where there had been attempts made to extend the term of the government without holding elections and he brought in Turkeish President Erdogan’s example to substantiate his claims. “These are not viable options in government. I am not going to talk about the circumstances or background of the story,”the President said while saying that a draft Constitution would be ready within the next two weeks for Cabinet to discuss. “We have told the Expert Committee to expedite the matter,”the President said. The President also said the National Audit Bill would soon be brought before Parliament after it has been discussed in Cabinet. “During the previous Cabinet, I promised to bring it in January. 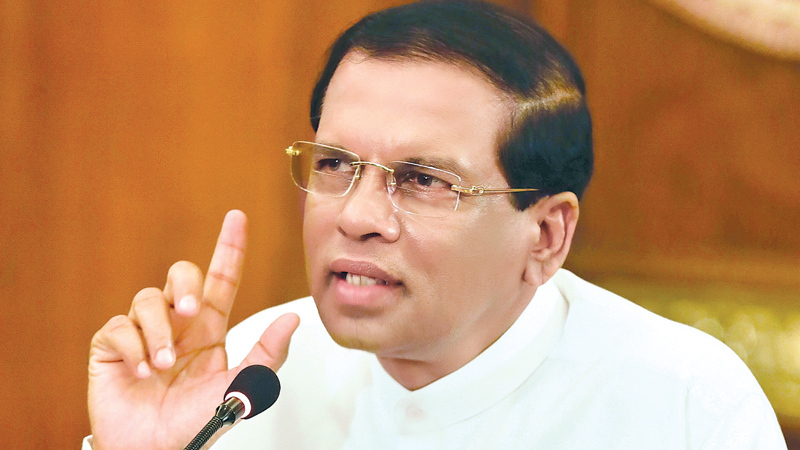 I will now direct them to do it as soon as possible,”President Sirisena said. Commenting on the Bandaranaike International Airport (BIA) and the runway, The President said there were various opinions expressed in newspapers about the standards of the runway which was rehabilitated. Despite these criticisms, the BIA, he said would very soon host Airbus 380; large aircraft and the contractors who did the work at the BIA were locals. Talking of the duty free shops, the President said that duty free shops were given on an open contract. “Earlier those shops were given to the cronies of ministers. “Now we are getting more income than what was earlier. We are getting up to 40 percent compared to the earlier 24 percent,” the President said. Kurunegala and Kilinichchi in the North. “Within the city itself, we have started new projects and restarted projects that were abandoned. Nothing will be sold to foreigners on a platter. The Port City was a good example of that. That was an outright betrayal in the history of this country. The previous government gave free hold land of 200 hectares to China and even my small helicopter could not go over it without the permission of the Chinese government. That was the worst betrayal in our country,” the President added. Referring to the UNHRC, the President said that his government had been able to put it off by two years, “We have to make submissions at the end of two years and we will do what we can. I am confident that I can salvage the country out of this abyss while protecting democracy and the independence of the judiciary”. The President also said that in the North, the government has completed nearly 60 percent of resettlement work. The primary task now, he said was to resolve the issue of missing people, “I will device a scheme for this,” the President assured. WEe done Sir, However do it fast and do not wait until the people start asking you" when are you going/" but go when they ask you "why are you going?" Our people cannot understand nor can they recognize the good work you are doing, though I must say that things - specially catching the thieves and murders and putting them behind bars is taking far too long and as time goes on people will blame you for breaking a promise. So Please establshi new courts at least to finish off the previous Government's bribery and corruption and murder cases and anounce that you are a man of one word and that you are going before they ask you When are you going/. You will be revered as a God if this happens. because our people must realise that by the time they realies what a good honest man you were it will be too late!!!! You will be a God revered for all time. Good on you . I am waiting to see whether my input is considered and included.as I saw my name in the published list. The people have to abolish the presidency.